The Finnish veteran pilot Kyösti "Kössi" Karhila was interviewed in the Finnish Aviation Museum Dec 8,2001. During the meeting mr. Karhila also gave lecture about the German detachment Kuhlmey, who fought on the side of the Finns during the decisive battles of summer 1944. The interview was concluded with lenghty discussions on the coffee table. The article is completed with the interview done by Ossi Juntunen on 1988, which was so complete that we ignored the topics already handled there and spoke about differents matters. Mr. Juntunen's interview is included in this article by his permissions. Originally it was published in the WW II Ace Stories -page. All the texts in this interview have been proof read, corrected and accepted by mr. Karhila. Part I: Ossi Juntunen's interview from 1998. The beginning of mr. Karhila's career, the war starts, first aerial victories, to Messerschmitt squadron, after the war, career as civilian pilot, other questions. Part II: interview by Virtual Pilots 8.12.2001. Kyösti Karhila introduces himself -video clip. Mpeg, size 1,3 MB. Plane types: Fokker D.XXI, Curtiss Hawk 75, Messerschmitt 109. Flight hours 556 during war, 24 000 as civil pilot. Decorations: Cross of Liberty 2rd Class, Cross of Liberty 3rd Class, Cross of Liberty 3rd Class with oak leaves, German Iron Cross 2nd Class, French Black Star Medal of Knighthood. Occupation: Airline pilot, superintendent of aerial activity. 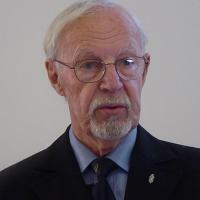 Founding member of Finnish War Pilots' Association Pilvenveikot and chairman 1980. Source: Suomen Ilmavoimien historia 11: Hävittäjä-ässät Kari Stenman / Kalevi Keskinen (Apali Oy). The interview was carried out in Finnish Aviation Museum on Dec. 8 2001. The interview is in its original form. The "coffee discussions" have been edited by moving similar topics to each other's company. Interviews 8.12.2001: Jukka O. Kauppinen "Grendel", Pentti "Buffalo" Kurkinen, Timo "Kossu" Niiranen and Janne "Netfly" Kallela. Typing: Marko "Maqu" Salo, Paavo Kajakoski.